In the event of a fire, those people climbing down the stairs should feel confident that the concrete stair treads are stable. Don’t wait for someone to yell “fire” before you discover your staircase is compromised. Check your precast stair treads today and ensure that they’re fireproof. How do you know if your concrete stair treads can resist the effects of a fire? If you’ve chosen precast concrete stair treads manufactured by Steel Stairs, you can put your fears aside. Our treads withstand extreme elements and will keep their integrity even in high temperature conditions. Are they cracking? Is there any sagging or rocking? If the reinforcement bar is exposed, you could have a serious problem in the event of an emergency. Those escaping a fire need proper traction to descend a stairway. If slippage occurs due to compromised treads, injuries (and related lawsuits) may result. Do you know the load capability of your treads? We test all of our products for load capabilities and integrity; it’s our way of assuring customers that even in the most inclement conditions, our stair treads stay strong. How is the tread fastened to the stair? Treads that include metal pans may rust and deteriorate. Due to the expert installation of our product, our concrete Stairs and treads stay where they’re supposed to remain. Why choose a stair tread that buckles under the pressure of fire or other extreme conditions? Choosing a stair manufactured by Steel Stairs ensures the safety of your pedestrian traffic. HUNDREDS OF STAIRS IN STOCK FOR IMMEDIATE DELIVERY ! 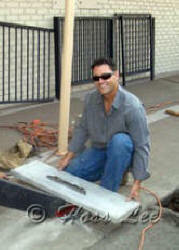 Hoss Lee’s Steel Stairs provides ADA Compliant, Precast concrete stair replacement, Repairs, and Stair Treads. Solve a serious liability problem with a permanent solution. 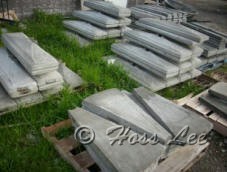 Precast concrete stair treads most important function by far is to protect the people who use a stairway. A slip on a poorly installed precast step can lead to a major lawsuit against the builder. Ensure this worst case scenario does not apply to you by installing a superior stair tread product and replacing it when needed. By doing so, you’ll not only keep those who climb the steps safe, you’ll also decrease your liability. Cracks, chips and sagging of the stair may mean it’s time to replace the tread. 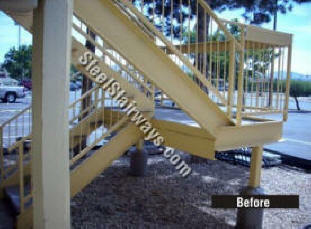 Thankfully, Steel Stairs offers 48-hour bid assistance, quality CAD design and over 50 years construction experience. 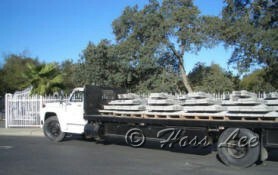 They manufacture their precast treads themselves, and have perfected a tread design that is safe and sound. There is no reason to wait for a safer stairway. Swapping Stairs out need not be a lengthy, costly event. 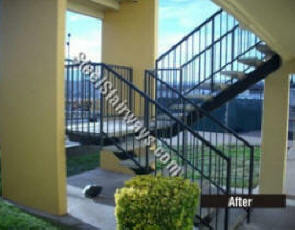 Steel Stairs provides a stair that is quickly installed, lessens your liability and keeps your budget intact.